Hair loss - a sign of aging? Hair loss is a natural part of the aging process, and as many as 70% of men suffer from pattern baldness at some point. Although age is one of the main factors which lead to hair loss, more and more young people are suffering from it. The causes are many and are often not the result of pattern baldness, which is medically referred to as androgenetic alopecia, the most common cause of hair loss. To understand hair loss, one needs to understand the hair growth cycle. Human hair goes through three distinct stages - anagen, catagen and telogen. During the anagen phase, the hair experiences growth - this phase can last between 3 to 5 years. The anagen phase is longer in Asians however; its can last as long as 7 years. The catagen phase is a short phase where hair growth stops and the hair roots start degenerating. 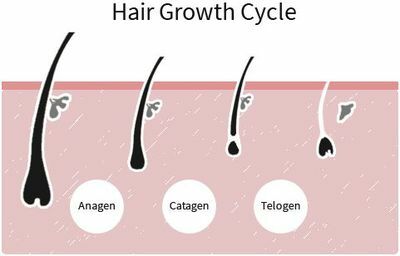 In the final telogen phase, the resting phase begins where the hair falls out and the follicle is inactive for 3 months before the hair cycle starts again. Each hair follicle is in a different stage of the cycle so you only shed a few hairs a day - up to a 100 on a healthy head of hair. Telogen effluvium: This is a condition where hair loss occur after a person experiences severe psychological stress or trauma to the body (for example due to childbirth or major surgery). The hair starts to shed weeks or months following the incident. Alopecia areata: This is a disease of the immune system which causes small patches of hair to fall out from the scalp. The disease usually occurs in childhood or young adulthood, but older people can also experience it. Medication & medical treatments: Chemotherapy and radiation treatment for cancer can result in hair loss. Certain medications can also cause hair loss for (e.g. birth control pills, and medication prescribed for hormone replacement therapy, depression and arthritis). Hairstyles and treatments: Styling hair tightly and using hot rollers or dryers excessively can cause hair loss. Chemical hair treatments can also cause damage to hair if performed improperly. Poor nutrition: A poor diet low in essential minerals and vitamins such as iron can affect the anagen phase and lead to hair loss. Recreational drugs: Anabolic steroids and amphetamines are also linked to hair loss. Underlying medical conditions: Hair loss can also be a symptom of an underlying medical condition like diabetes, lupus, or thyroid disease. Fungal infection: Sometimes people lose hair as a result of a fungal infection on the scalp. Trichotillomania: This is a condition in which people are driven by an internal urge to pull their own hair out. The conditions listed above can occur in both genders and as mentioned, this can happen regardless of age. It is often said that it is easier to keep existing hair than to grow new hair. However there are medications which can help stop hair loss and promote hair growth. Propecia is a prescription only medication for men that boosts hair regrowth. There are other medication like minoxidil which is a non-prescription medicine for both men and women and works in the same way. To conclude, older people are more prone to hair loss because of the natural changes that occur and affect the hair growth cycle. However, younger people can experience hair loss too, as it can be caused by any of the conditions listed above, or their lifestyle choices and habits. Obtaining advice and treatment early is better to reduce hair loss. If your hair loss is beyond any hope, then going bald might be the best way to go.